You know how arcades are pretty much dead in the US? You find them in places like bowling alleys and pizza restaurants, but otherwise the arcade cabinets of old are gone. In Japan however, the arcade scene is still thriving, and one of those arcade games is the Gundam Pod. You sit inside of it with screens all around you and controls in front of you. It’s like sitting in the pilot seat of a mobile suit except without the actual danger. It’s an experience you can only get in the arcade, as the Gundam video games haven’t progressed past sitting in front of your TV with a controller in hand, and most of those games are from a third-person perspective. Of course, moving beyond controllers was impossible before for home gaming, but now virtual reality headsets are here. 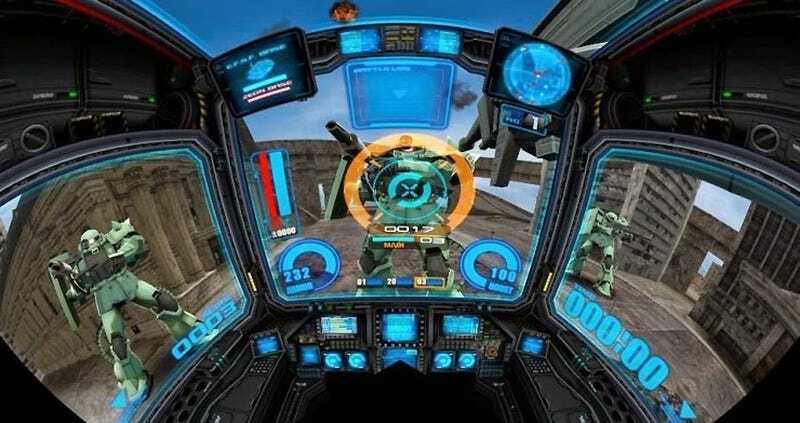 The feeling of being inside the cockpit can be recreated and allow you to actually pilot a virtual mobile suit. Granted, you won’t be able to actually push the pedals without a special peripheral, but using the controllers that come with the Rift and Vive headsets could give you the feeling of pressing the buttons and moving the throttle around. There’s so much potential here to bring that arcade experience to PC’s or even PS4 using PSVR. This doesn’t just apply to Gundam, series like Mech Warrior and Armored Core could also take advantage of VR to put you in the pilot seat and get a front row ticket to the carnage.